“My 14 year old cat Burrito started vomiting hairballs occasionally. Then it got so frequent, we had to seclude Burrito to the basement every night. She hated this very much because she had always slept between my husband and myself. Poor kitty! Well most of the time she would vomit undigested food during the day and then early in the morning, it was a white foam liquid. So we took her to the vet and they thought she could have acid reflex, so we put her on a medication twice a day. She didn't like that at all and it didn't work--she still vomited the same. So we went back to the vet and they said it could be IBD and they wanted to put her on another drug to see if the inflammation that was causing the vomiting would go away and then some other testing. NO NO NO! I didn't want to do that. So I did some research and found Ask Ariel. I ordered the suggested IBD Kit combo of Power Probiotic, Soothing Digestive Enzymes and the NotaSAN drops and waited for results. Wow it really worked! After I was done with the NotaSAN drops, we were doing our twice daily regimen of Power Probiotic and digestive enzymes. But every once in awhile, I would find a white foamy liquid on the floor but this was way better than before. Ask Ariel suggested to add Gastro ULC. I ordered it and made the diet change they suggested. That did the trick. My Burrito is happy again and back to sleeping with us. Does Your Cat Have Frequent Diarrhea, Vomiting or A Loss of Appetite? These can be signs of IBD or IBS. Seeing our cats so uncomfortable is very distressing. We try many different treatments to help give them some relief. Sometimes conventional veterinary care offers some short-term options that help our cats feel better initially, but then the problem returns. Pet owners may feel very frustrated after trying a variety of "prescription diets", medications and treatments with limited success. Thus, their kitty may be on prescribed steroids such as prednisone as a last resort to control the symptoms. What is Feline Inflammatory Bowel Disease (IBD) or Irritable Bowel Syndrome (IBS)? Feline Inflammatory Bowel Disease (IBD) is a diagnosis used for a variety of intestinal disorders found in cats. These disorders are characterized by an abnormal accumulation of inflammatory cells in the lining of the intestine. Your veterinarian may have diagnosed feline IBD after obtaining a biopsy, which shows an abnormal accumulation of inflammatory cells. Other causes of inflammation such as parasites, bacterial or viral infections, exposure to toxic substances and pancreatic causes of small bowel disorders would have been ruled out. 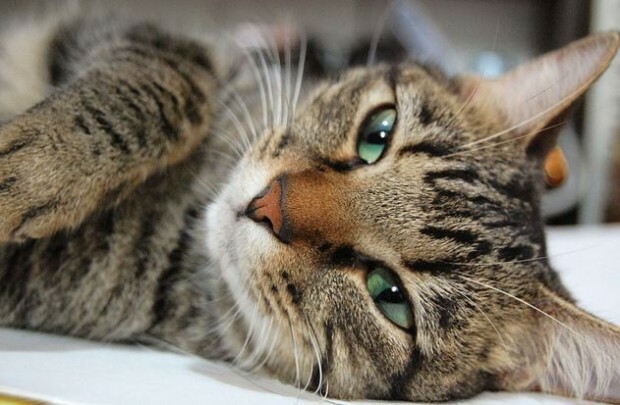 Cats may also be diagnosed with Irritable Bowel Syndrome (IBS). Irritable Bowel Syndrome in cats is often caused by food intolerances, possibly due to allergies, the ability to effectively pass food through the gastrointestinal tract, and stress. Cats with IBD and/or Irritable Bowel Syndrome may develop intestinal lymphoma as a result of years of inflammation in the intestinal tract. Cats may not show signs until they are older even though they may not have shown a great deal of GI distress in their younger years. Cat IBS natural remedies can offer long-term relief from symptoms, especially when used in conjunction with recommended treatments from your veterinarian. Using the appropriate hypoallergenic, anti-inflammatory diet along with supplements specifically for IBD, such as the IBD Kit, can be life changing for the cat and the owner! Feline Inflammatory Bowel Disease (IBD), chronic diarrhea and Irritable Bowel Syndrome (IBS) can be treated using a few natural supplements along with diet changes, which can help your cat feel better. These quality products have been used successfully in veterinary hospitals since 2005. The products are available through the Ask Ariel website in Orange County, CA but are recommended by veterinarians nationwide because they really work. The IBD Kit - The IBD Kit includes 3 unique supplements specially designed for cats and small dogs to calm and soothe the digestive tract, firm up stool, relieve tummy rumbling and reduce gas, mucus and bloody stool. The Kit includes Power Probiotic, Soothing Digestive Relief and NotaSAN Anti-Inflammatory Drops--products taht have been recommended by veterinarians since 2005. Ideal for pets with IBD and IBS as they are gentle, easy to use and all-natural. No Fillers! Please click on the link to view testimonials. Power Probiotic -it is important to use a multi-strain, powerful Probiotic that has been used extensively with cats that have IBD. We recommend the Power Probiotic, which is easy to administer, very effective and well tolerated by cats and dogs. The product has been third-party tested and guaranteed to contain the amounts of friendly bacteria indicated on the label. Pure and natural with no fillers, Power Probiotic is the best probiotic to use for pets with IBD and IBS. Soothing Digestive Relief for Pets is a digestive enzyme that breaks down a cat's food, firms up the stool and helps increase absorption. It is a gentle formula that has helped thousands of cat and kitten owners to stop the diarrhea, vomiting and discomfort associated with IBD and IBS. It contains herbs to ease indigestion and discomfort, and the product is safe enough for a cat to use it for life. NotaSAN Drops - These gentle homeopathic drops are safe for even the smallest pet or kitten. The drops reduce inflammation in the intestinal tract and act like a natural "antibiotic". The drops are tasteless and do not contain alcohol, making them very easy to administer. They seem to relieve pain and discomfort quickly. There are many testimonials about the formula. Gastro ULC -This product acts like a natural "pepto bismol". It coats the stomach and relieves the burning and pain associated with acid reflux and acid stomach. This product should be used in conjunction with the IBD Kit, as acid stomach begins with poor digestion. Many cats with IBD and irritable bowel are vomiting, and this creates a great deal of irritation in the esophagus and stomach. Over time, the Gastro ULC enables cats to stop needing medications such as Pepcid. In addition to the supplements, some diet changes are needed. Cats with IBD should not eat grains, which are often found in prescription diets. Dry kibble is high in starchy carbs, which can cause indigestion. Cats may also have food allergies or intolerances, which further the inflammation. Ask Ariel is committed to helping you change your cat's life. We understand that you have tried many different foods and medications, but there is hope and there is help. We want to help by tailoring a program specific to your feline IBD symptoms and treatment needs. Please just add a note on your order with AskAriel about your cat's current diet and current symptoms. You will receive diet tips from the Ask Ariel Pet Nutritionist on the packing slip that comes with the product directions. Susan Davis, the Pet Nutritionist at Ask Ariel, offered holistic consultations for over 10 years at VCA Hospitals and online and now uses her expertise to help all cat owners who use the Ask Ariel supplements. Most cats show improvement within a few weeks, although it is important to remember that this condition is characterized by an occasional bout of gastrointestinal distress. Our goal is to help reduce the frequency and severity of these bouts, giving your cat a good quality of life. Holistic care can make a difference, and we look forward to helping your cat finally feel better! "Our cat Tipper had feline IBD Inflammatory Bowel Disease and while we tried many different foods, supplements and medications, he still did not have a formed stool. About a month using the IBD Kit and diet suggested by Ask Ariel, Tipper started having normal bowel movements and has been normal ever since. My husband and I want to thank you and the staff at Ask Ariel Your Pet Nutritionist very much for your advice and your products which have worked, what we consider to be a miracle in the life of our cat. I can imagine you are also very gratified when people like us let you know how your efforts to help us have resulted in a life for us and our cat." Need help for your cat? Please contact support@askariel.com and we will be glad to assist you.